After selling out in 2016 we hope to get 1000 people for our 2017 and 8th conference. This would be a landmark achievement both for the conference and the history of the Principles. Hanukkah, right up there with Yom Kippur and Pesach, is the festival that most Jews keep. The message of Hanukkah is really the essence of the Jewish People. We light candles to symbolize our desire to light up the world. 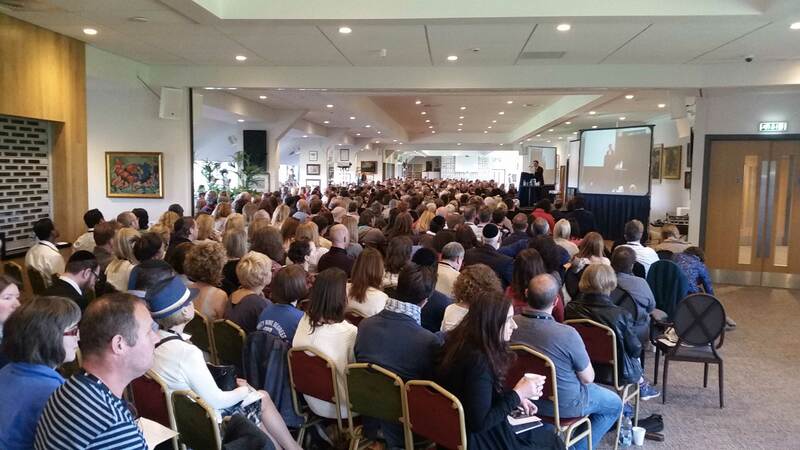 The ancient Jewish mission of being a ‘light to the nations’ is not an easy one. And through the generations, we have accomplished much in the face of great adversity. But our job is by no means done. People are still selfish; people still kill for pleasure; people still lack respect for the rights of those around them. This world is not the world we want it to be and we do not want to give up on hoping that it can be different. Hanukkah reminds us not to give up hope. If ever the Jewish People was defeated, it was at Hanukkah. We were occupied by the world’s superpower, oppressed, mostly assimilated and alienated from our values. And yet a small group of people stood up for what they believed in; a faithful few who refused to lie down and die. And their dedication, belief and self sacrifice enabled them to ensure Jewish continuity till today. Hanukkah comes in the winter at a time when it’s dark and cold. It’s easy to feel discouraged. So we light lights and remind ourselves that just as one flame can dispel a whole lot of darkness, so one individual can bring a lot of light to a dark world. A story is told of a father and son in Auschwitz. The father used some of their very meager ration of margarine to burn as a Hanukkah light. The son questioned the wisdom of wasting precious food. His father responded that a human being can live for a few weeks without food, a few days without water, a few minutes without air – but he cannot live for even a moment without hope. The Hanukkah lights represent hope. The Jewish hope of a better and more Godly world; of a future that we are happy to bestow upon our children. It is our belief that each and every one of us, with self sacrifice and dedication, can contribute towards that future in a very meaningful way, just as the Maccabees did 2000 years ago. In 332 BCE, Alexander the Great conquered Israel. The Greeks initially were a fairly decent lot and the Jewish People experienced peace and prosperity under their rule. Greek policy in general was to subdue a population by assimilating them into Greek culture; this was almost invariably effective. However, by 167 BCE, the Greeks had become impatient with the Jews and their stubborn Monotheistic ideas. They set out to destroy Judaism more actively by imposing a ban on Jewish tradition, punishable by death and defiling the Temple in Jerusalem. While many Jews succumbed to the pressure, a small band of die-hard Jews, known as the Maccabees, revolted and, three years later, succeeded in evicting the oppressors. The victory was nothing short of miraculous, somewhat equivalent to Iraq throwing America out by force of arms. Having regained control of the Temple the Maccabees wanted to rededicate it immediately. 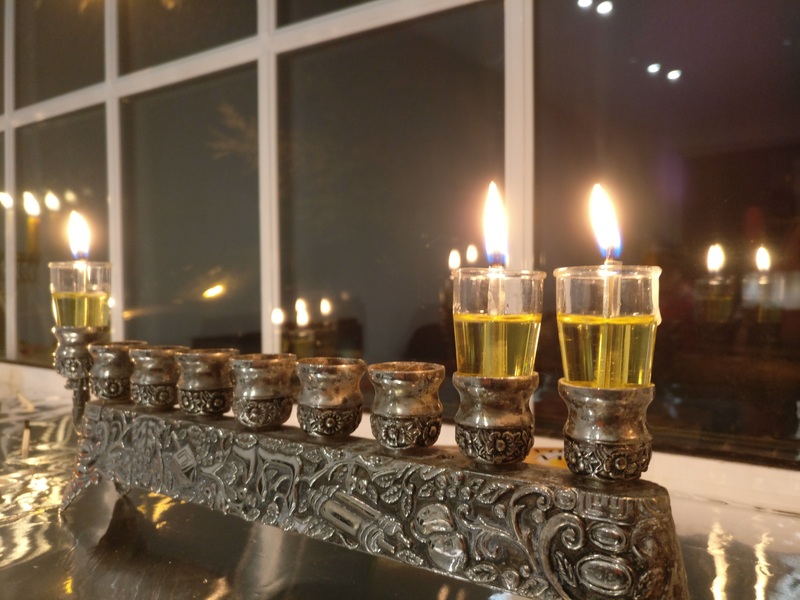 Only a single vial of olive oil was found – enough to burn in the Temple Menorah for just one day. However, they needed for it to last until new olive oil could be produced. Another miracle occurred and the oil burned for eight days. Ever since, we have lit a Hanukkiah to celebrate those 8 days. Hanukkah lights should ideally be lit when darkness falls, in this country around 5pm. If this is impractical, they may be lit at any time throughout the night. One light is lit on the first day, two on the second and three on the third etc. The lights must burn for a minimum of half an hour. On Friday night, they should be lit before the commencement of Shabbat (around 3.50pm) and burn till around 5.30pm. On Saturday night, they should not be lit before 4.50pm. Olive oil is the preferred fuel, but candles may also be used. A Hanukkiah made of metal is best, but not necessary. The purpose of the lights is to publicize the miracle of Hanukkah. As such, they should be lit in a place where they are clearly visible from outside. In a downstairs window that faces the street is best. At times of anti Semitism the Jewish people would light the candles in an inner room. We are fortunate to live in freer countries today and can light them in their preferred location. 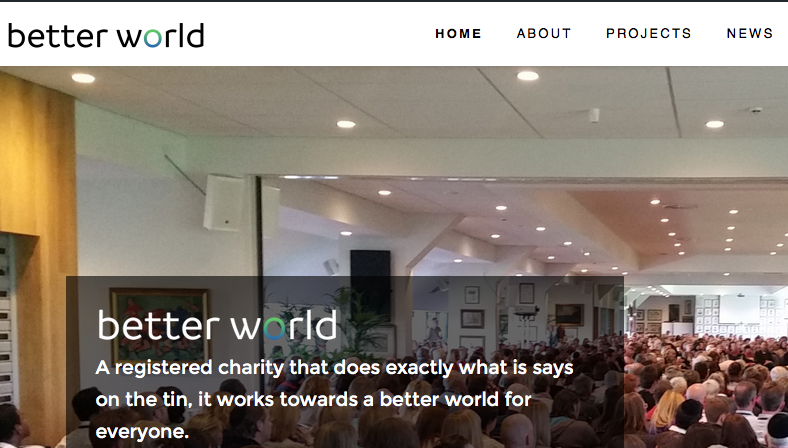 June 7th saw the launch of the Better World Website.